The latest buzz word in the creative industries? Virtual Reality. It's everywhere. With the launch of Playstation VR last month, the unveiling of titles fit for the consumer has begun. Hurrah! This week sees the launch of Robinson: The Journey. At Voice Squad we've been secretly preparing to celebrate this new title the only way we know how - through voice! Listen on for an insight into Glen McCready's process in recording for his character of HIGS. 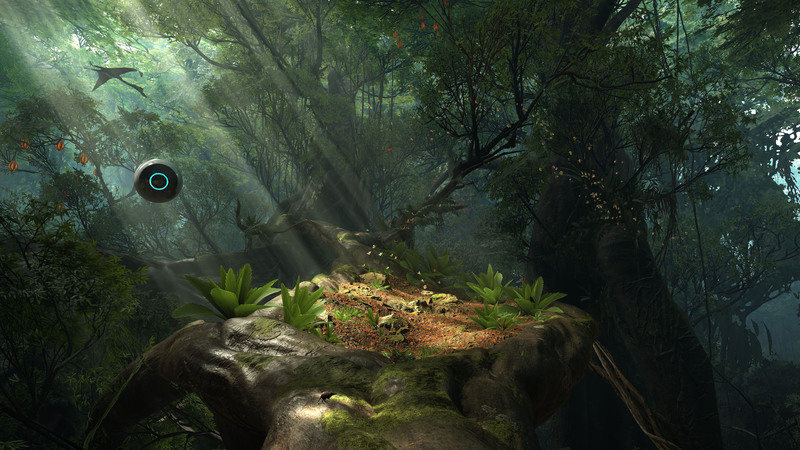 in Robinson: The Journey, and just how the VR world differs from anything experienced before. Robinson: The Journey out now on PS4 VR. Listen to more of Glen McCready. Voicing HIGS, the A.I. floating orb, robot companion and protector of young Robin in ‘Robinson: The Journey’ was incredibly exciting. It’s a Playstation 4 VR game, and the character goes through some pretty seismic changes during the course of a series of staggering adventures. The team kindly arranged for me to try out the full VR experience once I was part way into the voice recording process. Up to that point I knew the tech was all very innovative and very cutting edge but I probably also suspected a certain amount of hype and exaggeration. After all, how much better than 3D movie could it all be, I thought? Oh, me of little faith! Once I put the VR headset and headphones on, the whole experience surpassed every single one of my expectations. I was utterly immersed in the game's vivid and alien landscape and of course in its eerily atmospheric soundscape. Everywhere I looked there was real visual spectacle, mind-boggling detail and such a vast sense of scale. Since recording I've realised that one of the influences, sort of unconsciously, was a robot from an old Disney sci-fi movie called The Black Hole. A robot called ‘V.I.N.CENT’ (Vital Information Necessary Centralised) and I just remember as a kid thinking “wouldn’t it be great to have that robot as a friend?” and I suppose that was really my mission when recording the character for the game: to illicit that sort of response in the mind of the player. The world of Robinson is so rich and so fully-realised that I felt a huge responsibility to ensure that my contribution never did anything that might break the VR spell. Really the only difference recording this character, and recording for a VR game, was I suppose the way it worked on my imagination, and when I talk about pressure I’m thinking about just being as convincing as I can possible be because this is a robot, it’s an A.I. robot. The fun of it is if you can make them as real as the most real human character, and then you sort-of really get that idea that the technology is so extraordinary you forget that this is a machine that’s interacting with you. At the start of the game, HIGS is very much the voice of caution: he’s very risk-adverse, you know. “Do you really think you ought to explore that dark jungle pathway?” or “Do you really think you ought to climb this ravine? Perhaps you should just stay at home and wait to be rescued…” There’s some really clever reverse psychology in the gameplay in that the character changes that as he goes through as he does develop quite a taste for adventure, in the end. I remember seeing the very first concept animations and images of HIGS and thinking that it’s so much more than a floating orb you know that really doesn’t do it justice. It really is a thing of beauty, you know, and if there was a toy, I’d be queuing at the tills.